The chapel provides a real challenge for sound reinforcement systems, even when reproducing only the spoken word, because of both the large amount of reverberation (an RT60 of more than two seconds) and the restrictions imposed on historic buildings. The city of Geneva reached out to Vaud, Switzerland's, Studio Equipment to install acoustical treatment but Studio Equipment CEO Terry Nelson quickly recognized that the best answer would come from the beam-steering technology of Renkus-Heinz ICONYX Gen5 loudspeakers. The chapel, now named for Camoletti, seats 150-200 people for funeral services. It is relatively small, only 13 metres (42.7 feet) long and half that wide but has a vaulted ceiling that rises to a bit more than 8 metres (26 feet). Services in the chapel are mostly spoken word, but also make use of recorded music. 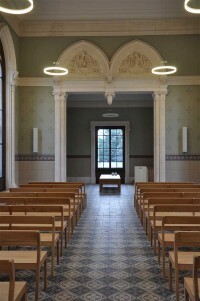 "The chapel is a listed historic building," describes Nelson, "so we were limited to a maximum thickness of about 3mm (0.12 inches) for acoustic panels. That approach would have been labour-intensive, inefficient, and generally just a waste of time and money. However, we needed to find a solution. Then the light went on in my head, and I thought, 'We won't change the acoustics, we'll change the sound system.' Our experience with Renkus-Heinz in previous installations such as the former Grand Hotel in Caux for Initiatives for Change made ICONYX the obvious choice." Having successfully worked with Studio Equipment on other projects, the city staff was open to Nelson's suggestion. The IC8-RN houses eight four-inch, purpose-designed, coaxial transducers, each with its own array of three one-inch tweeters. This triple tweeter "array within an array" design reduces the distance between HF sources for greatly improved high-frequency performance with consistent, broad horizontal dispersion. Eight audio amplifiers and DSP channels control the transducers, enabling a single IC8-RN column to form up to 4 individually shaped and aimed beams, controlled down to 800Hz. All of this is fit into a compact package only a little more than three feet high and six inches wide. The IC8-RN's low profile was key to minimising intrusion on the chapel's aesthetics but putting the system in was tricky nonetheless. "The installation needed to be as discreet as possible," states Nelson. "We had to use existing cable routes, which was difficult, and no cables were allowed to be visible." Getting the system in place was just the start; Nelson needed to configure it to deliver clear sound to mourners in a space where simple conversation was difficult. "The maximum distance you can have in the chapel between two persons speaking and still retain intelligibility is no more than two meters-and even that is pushing it," Nelson laments! This is exactly the sort of problem beam steering was developed to solve. Nelson portrays the process of tuning the beams as careful and nuanced. "I initially thought to use two beams but simulation in the BeamWare III program incorporated in RHAON II software suggested that three would be better, so I went with that," he recounts. "I aimed the third beam further down than the others to avoid hitting the rear wall and used a different high-pass filter cut-off point for each beam. The EQ required was minimal, and the result is very musical."